Most men want to have a physique that is toned and muscular, and workout in order to help themselves attain the right look. Diet and exercise are great ways to lose weight and feel great, but they don’t always help. In some cases, excess fat may remain on the body. Aging, too, can cause a “sagging” appearance to otherwise toned muscles. A sagging body often causes self-esteem issues and may even make it hard for men to find clothing that suits them. It used to be that men who had a sagging body would have to just deal with it. Fortunately, those times are gone and men in New York City can now obtain a male body lift to help themselves get the look they want. A body lift is a set of surgical procedures that help remove excess sagging skin and excess fatty deposits from areas throughout a man’s body. This helps create a more toned, youthful, and healthy appearance in men. What Kind Of Body Lifts Are There? ✓ Upper Body Lift. This is a body lift that will remove excess skin and fat from your arms, chest, and back. In many cases, an Upper Body Lift is also combined with gynecomastia treatments. ✓ Middle Body Lift. This body lift removes excess fatty deposits around your midsection, along with extra skin. If you have a “beer gut,” then this is probably going to be the lift you want. ✓ Lower Body Lift. If you have excessive fat and skin near your thighs, buttocks, or legs, you may be a better candidate for a lower body lift. ✓ Full Body Lift. This is a combination of all three body lifts and works to help overhaul your entire body. If you want very drastic results, this is going to be the choice you will want to make. Each body lift will be a little bit different, based on the individual patient’s needs and their body type. Most body lifts involve a combination of liposuction and skin removal to obtain the desired results, and will typically take anywhere from 2 to 4 hours in the operating room. To learn about the right body lift for you, you will need to schedule a consultation with Dr. Steinbrech and his Patient Care Coordinator. 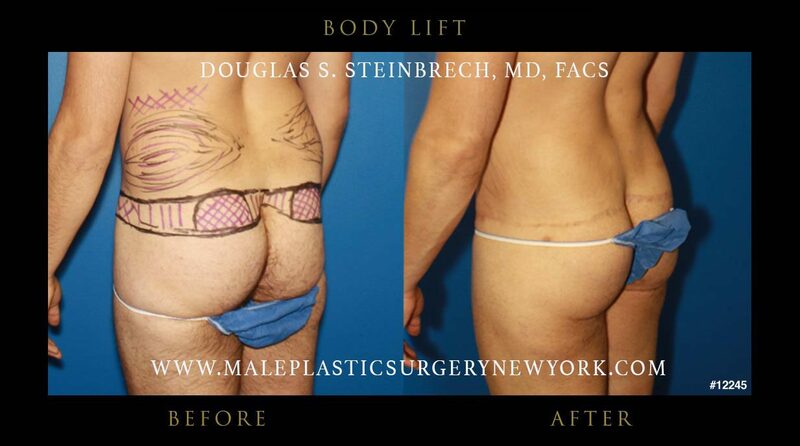 The team and Male Plastic Surgery New York will detail the process that will be right for you and explain what you should expect when undergoing a Male Body Lift.